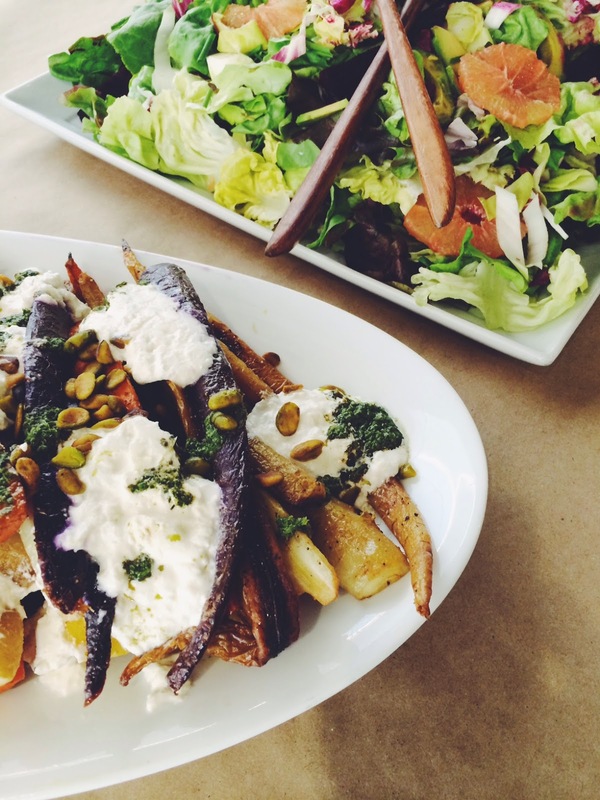 Want my recipe for delicious curry roasted carrots with pistachios, mint and basil pistou and burrata? Here you go and you're welcome. Lightly chop garlic, mint and basil, combine with all other ingredients in food processor until mixture is bright green but you can still see pieces of the mint and basil. Add salt and pepper to taste. Preheat oven to 400 degrees. Chop carrots lengthwise from top top to bottom, leaving a small amount of the stem in tact. On a large sheet tray oil the carrots and add the cumin, coriander, turmeric, and salt and pepper to taste. Mix making sure to coat carrots evenly and cook in the oven for 40-50 minutes or until soft on the inside and caramelized on the outside, flip the carrots half way through. Let cool for a bit, then plate with evenly sized dollops of burrata, top with the mint and basil pistou, a light drizzle of balsamic, salt, pepper and pistachios and enjoy!